Make Your Own Condiments and Essentials - Tastier, Healthier, Fresh Mayonnaise, Ketchup, Mustard, Peanut Butter, Salad Dressing, Chicken Stock, Chips and Dips, and More! You work hard to make dinner--choosing the best food, mastering preparation techniques, and picking the perfect recipes. But what about the unsung staples, the ingredients and condiments that build and accompany your meal? Too often, the store-bought versions are loaded with extra salt, sugar, allergens, and preservatives, and they end up bland and uninspiring. But you don't have to limit yourself to the same tastes and the same plastic bottles. With Kitchen Pantry Cookbook you can create your own staples--fresh, delicious, and just the way you like them. 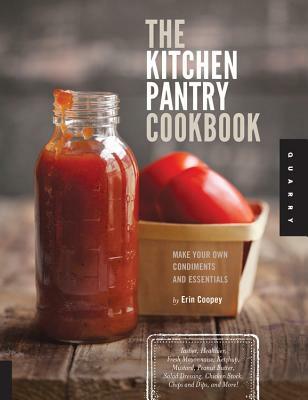 Chef and winner of Food Network's Guy's Grocery Games, Erin Coopey shows you 90+ recipes and variations to personalize your pantry. You'll never go back to the bottles. Erin Coopey calls herself a "glorified home chef" even though she has training as a culinary professional and was selected to be a judge for the 2016 Edible Communities EDDY Awards. Cooking is her passion, and she loves the way food brings people together. Coopey's philosophy is that good cooks must possess a generous spirit. She also believes that cooking should be fun! This philosophy is reflected through Coopey's books, blogs, and classes. If you're in Seattle, you can join her for a cooking class. Otherwise, check out The Kitchen Pantry Cookbook and her blog, The Glorified HomeChef:www.glorifiedhomechef.com.